Astrowright | Chronicles of someone trying to get off the rock. It all began with the discovery of a mysterious pair of blue pressure suits at a Cape Canaveral Air Force Station facility in 2005 – suits that didn’t exactly belong to any known NASA space program. Thus, the secretive military Manned Orbiting Laboratory of the 1960s, or MOL, was re-discovered as security officers ventured into a long-locked storage room in a facility known as the Launch Complex 5/6 museum. There, they recovered two MH-7 training suits worn by Air Force astronauts that never got a chance to fly to space (at least not with the Air Force; several went on to successful NASA careers). Subsequently, in response to a FOIA request, the clandestine National Reconnaissance Office (NRO) in July of 2015 declassified tens of thousands of pages of MOL program documents and a gallery of images. Truly, the database is a trove of information on the formerly-secret military reconnaissance space program that might’ve been. Now, I should admit that I found most of the released information to be soberingly bureaucratic in nature, and because many have covered the generalities of MOL in the intervening few years at great length, instead of describing the overall program I wanted to drill inward and focus on an intriguing series of omissions in the MOL literature. To Man, or Not to Man? In the space community, there is something of a longstanding rift between the “human exploration” and the “robotic exploration” camps. The former cite the dynamic advantages of human beings as intelligent, adaptive tools of exploration, while the latter cite the woefully-heavy and expensive life-support requirements of the former as a justification to send robots instead. The pro-robot folks point to the many scientific successes of robotic spacecraft, such as Voyager, Galileo, Cassini, and New Horizons, while the pro-astronaut types point to being able to share the human experience and context of exploration in a way that no robot can. And so the argumentation goes. Standing more in the “pro-astronaut” camp (and as a former spaceflight “Crew Systems” manager/analyst), I like to think of myself as quite versed in the many legitimate justifications for crewed spaceflight. That’s exactly why I found myself surprised to see some of the human spaceflight mission sections of the MOL documents redacted… 55 years after the fact. Admittedly, some (if not most) of the redaction found in the released documents relates to the optical performance of spy telescopes or the detection of enemy nuclear missile launches. I can easily recognize the tactical benefit of keeping some of those details under our hat, even to the present day. However, neither of those have to do with crewed spaceflight, and it is the presence of additional redaction in the human context that began to lift my eyebrows. These, again, redact something other than the well-known and well-trodden justification for astronauts performing EVAs, such as in-space construction, repair, rescue, etc. Idling on a single table in one of hundreds of documents amidst the 20,000+ pages included in the whole of the NRO FOIA release on MOL stands a single, critical term. Now, MIDAS – the term found one row up from SAINT – is something I had heard of before, relating to the detection of Soviet nuclear missile launches. As MOL was a secret reconnaissance platform, I found mention of MIDAS entirely unsurprising, and from the human spaceflight perspective, entirely irrelevant. SAINT, then, appeared to be – at least in part – an openly-acknowledged Air Force military space program of some sort, along with Blue (Air Force) Gemini, which was the vehicle used to get to-and-from MOL. But “Saint” in this instance wasn’t capitalized. So, what sort of space program was it? A literature search of Air Force planning documents from the mid-1960s turns up the following section on SAINT, excerpted from a June, 1966 document from the USAF Historical Division Liason Office, entitled, “The Air Force in Space. Fiscal Year 1962,” which identified SAINT as an acronym for Satellite Inspector. However, SAINT is clearly described as a satellite (i.e., robotic) research and development program. Did MOL missions really include a human parallel to “satellite interception and neutralization” as suggested in Table 1 of the 1964 technical document? Now, reviewing the original redacted sections above in the context of the Air Force SAINT program, one begins to assemble a clearer picture of one possibility for what I like to call this “missing” human mission. …and while many are quick to characterize MOL as a relic of a “by-gone era,” this may also – due perhaps especially to its modern redaction – serve as a glimpse into our own human spaceflight future. If viewing the MOL program as earmarking astronauts as human satellite inspectors, (might we refer to them as Astronaut SAINTs? ), ancillary details of the MOL documentation detritus suddenly begin to fall into place. For example, in the report, “PRELIMINARY TECHNICAL DEVELOPMENT PLAN FOR THE MANNED ORBITING LABORATORY” (6/30/1964), mentioned earlier, look to the table titled, “Primary Experiments – Assessment of Man’s Utility,” and consider that the redacted position of experiment P-7 (“Inspection”?) is located right after P-6, “Extravehicular Activity.” That would make absolute sense from a planning perspective. One has to learn how to walk before one can run, after all. Consider also that the Astronaut Maneuvering Unit (AMU), seen above – a longer-range version of the Manned Maneuvering Unit (MMU) that would be used by NASA Shuttle astronauts – was developed by the Air Force for the MOL program. Why might military astronauts need to travel some distance from their station if via umbilical tether they can reach and repair any portion of the MOL station, itself? Signs point to SAINT. Finally, note that Table 1 of the “PRELIMINARY TECHNICAL DEVELOPMENT PLAN (PTDP) FOR THE MOL PROGRAM” (3/10/1964), in which I first discovered the mention of SAINT, appears to be ordered alphabetically. Perhaps coincidentally, the redacted term associated with SAINT sits between E (ELINT) and M (Meteorology). “Inspection” fits there quite nicely. A Titan III C rocket lifts off, carrying an unmanned U.S. Air Force Gemini-B spacecraft and a mockup Manned Orbiting Laboratory module, on November 3, 1966. All this weighed together, it certainly seems like serious planning was given to human anti-satellite (ASAT) operations in the 1960s, and for reasons unknown, knowledge of this reality remains largely and intentionally obscured today. This sort of activity would have been an extraordinary venture for human spaceflight – far riskier than anything ever attempted in human extravehicular activities, aside from, perhaps, moonwalkers venturing a great distance from their lunar lander via rover. His choice usage of the word, “inspect,” suggests he might have known just a little bit more about plans for Astronaut SAINTs than he was letting on. So, why might the proposition of Astronaut SAINTs remain classified today? One is forced to consider the obvious possibility that it remains classified because such a role for future military astronauts is still on the table. Given the realities of the infamous 2007 Chinese ASAT test along with the recent Russian test of the PL19/Nudol direct-ascent anti-satellite weapon, this may not be surprising. Further, the timing of the release and redaction, in 2015, might be noteworthy. As it happens, Russia launched its own “satellite-fixer/satellite-killer” satellite in 2014, which practiced sophisticated satellite maneuvering and rendezvous maneuvers. This may have (rightfully) spooked U.S. defense strategists into clamping down on all mention of SAINT. …and, with the recent White House push both for increased commercialization of space as well as for a dedicated Space Force to go along with it, it is entirely possible that in gazing between the lines of these MOL documents we are also glimpsing a vision of military space activities that may yet come to pass. Because no one can be certain about one’s own ability to participate in the future, I have a couple of ideas in the works that I’d like to post to the future just in case I (for some reason) don’t get around to it before then. I call this force “Antithy,” which as I propose it is a fundamental property of matter – a repulsive force that increases in strength proportionally with distance (i.e., the father away two objects are from one-another, the more strongly they repel). This is in direct conceptual opposition to Gravity, which is a fundamental property of matter – an attractive force that decreases in strength proportionally with distance (i.e., the closer together two objects are from one-another, the more strongly they attract). At first blush, this proposition seems impossible, as soon all objects would be accelerated from one-another beyond the speed of light and the universe quickly undergoes infinite expansion. However, this conclusion is made without considering the very important spacetime curvature implications of General Relativity. When looking at the cosmological implications of an Antithetic force from a higher-dimensional context, one quickly realizes that such a force produces an initially-expanding but self-closing universe. The closure quickly solves Antithy’s own problem, for once closed, the Antithetic Force works in all directions, supplying a sort of repulsive pressure across the universe to counteract initial expansion and shepherd all of the matter in the universe into equilibrium positions with respect to all other matter (like a web of repulsive magnets on the surface of a sphere). With this in mind, on small cosmological scales, Gravity dominates. On large cosmological scales, Antithy dominates. Thus, Gravity/Antithy is not the weakest but the strongest fundamental force. There you go. I’m trying as hard as I can to get this proposition into a publication for critical review, but tempus fugit. Consider this post a backup for posterity. We’re just hours from a renewal of our wedding vows downtown at a Las Vegas-style Strip-front “chapel,” to be wed by a singing Elvis. Will we raise the bar for our ten-year renewal celebration? Or, in the spirit of this experiment I suppose I should ask in the present-tense, are we raising the bar? What are we doing? The big difference this year compared to previous years (Elvis aside) is little Grayson! At the time of this posting, he should be about 5-and-a-half. …and I’m dying to know all about who the little guy is becoming! Developmentally everything going okay? (He seems to be cruising so far!) Personality? Does he still hate sleep? I can only presume the 2012 end-of-the-world hype will go exactly the way of the 1999, 2000 end-of-the-world hype. The economy is in shambles, particularly in Las Vegas. Are things now looking up? Please, tell me all about 2017! 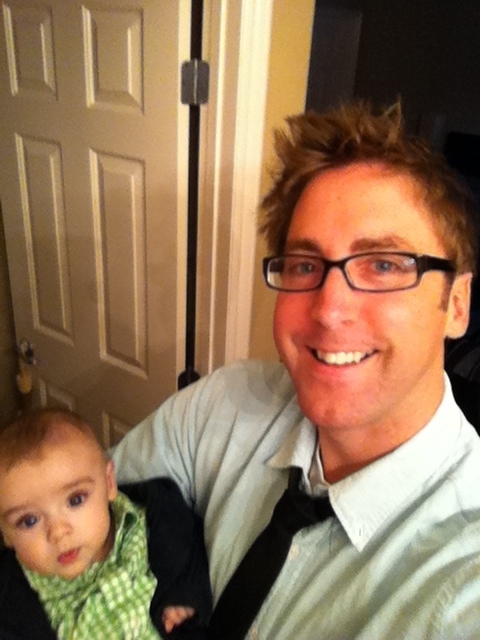 Me (proud Dad) and Gray, March 17, 2012. Humanity’s first human-habitable inflatable spaceship, (or as those in the industry prefer to call it, “expandable” spacecraft), is soon to launch off-world. Tucked inside a Dragon cargo transport‘s “trunk” and perched atop a SpaceX Falcon 9 rocket, this momentous departure targets the International Space Station (ISS) and is slated to occur today. The precious expandable cargo is itself a simple test article, (or as those in the industry are keen to refer to it, a “pathfinder technology demonstrator”), which was manufactured by Bigelow Aerospace right here in Las Vegas, Nevada. Aptly titled the Bigelow Expandable Activity Module, or BEAM, the craft is designed to attach to the ISS and stay put for at least two years to see how it behaves. Now, media outlets large and small, having caught wind of this impending technological departure from the streampunk-like status quo, (where hulking, submarine-like cylindrical pressure vessels serve as our spacecraft shells), are repeating the same, few details with great enthusiasm. However, general curiosity about BEAM’s design, structural elements, and expected performance is going generally unanswered. 1] What are BEAM’s pair of small, antennae-like protrusions for, anyway? While they might look like tiny, satellite-TV-style dishes, these circular devices serve a radically different function. Known as standard Flight-Releasable Grapple Fixtures, or FRGFs, they’re the means by which the ISS’s robotic arm will snare BEAM, yank it out of Dragon’s trunk, and plug it on to the ISS’s Node 3 module. NASA provided Bigelow Aerospace with two FRGFs to install on BEAM as part of their contract. Think of them as the receiving half of an enormous robotic handshake upon BEAM’s arrival at the ISS. 2] What about the sleek, wavy metal collar on the ‘hatch’ side of BEAM? As it turns out, this eye-catching part of BEAM’s exterior was manufactured by the Sierra Nevada Corporation and is known as a Passive Common Berthing Mechanism, or (you guessed it), a PCBM. This is a standard mechanism for unpowered craft that can’t dock to the ISS using their own thrusters and must therefore be snatched up by the ISS’s robotic arm and manually ‘plugged in’ to one of the station’s active ports. The PCBM was supplied to Bigelow Aerospace by the Sierra Nevada Corporation as part of the NASA BEAM contract, and it was integrated into BEAM’s structure at Bigelow’s large North Las Vegas facility. 3] So, what are BEAM’s walls actually made of? “Five outer layers of graphite-fiber composites separated by foam spacers” that function as a micrometeorite and orbital debris (MMOD) shield. Admittedly, it has been some time since the article was written, and details may have shifted somewhat in the intervening years. -But, in a general sense, BEAM could be reasonably expected to follow the same sort of structural format. For something a little more recent, one can also argue for a fairly close approximation of BEAM’s softgoods in another, modern inflatable spacecraft design. European aerospace titan Thales Alenia Space (TAS), (responsible for the design and manufacture of the rigid shell backbones of the European Space Agency’s Automated Transfer Vehicle supply ships as well as the Cygnus cargo freighters, and others), has its own inflatable spacecraft design known as REMSIM. In landmark 2009 research presented at the International Symposium on Materials in a Space Environment, led by TAS researcher Roberto Destefanis, the REMSIM layers are revealed (and put through their paces). In the above diagram, MLI stands for Multi-Layer Insulation (think heat shield), BS stands for Ballistic Shield layer, and the rest are as described. As can be seen, they generally agree with the Popular Science description of the Bigelow approach. So, odds are, if you want to know what’s inside BEAM’s collapsible/expandable spacecraft skin, the REMSIM “stack” isn’t a bad place to start. 4] Can BEAM really shield well against micrometeorite and orbital debris strikes? When many are introduced to the concept of an inflatable spacecraft, a natural first reaction is alarm. On Earth, most inflatable objects are very vulnerable to punctures and ruptures (e.g., party balloons). Wouldn’t an inflatable spacecraft be far more vulnerable than rigid aluminum modules to micrometeorites and bits of space junk zipping around at mind-bending orbital speeds? Well, much like a Kevlar vest has no problem stopping a bullet, it turns out that expandable spacecraft have no problem holding their own against impinging space chunks. While specific information on how well BEAM’s softgoods hold up under punishment is proprietary, we can return once again to REMSIM for a good example. The Bigelow debris shielding approach, like REMSIM, uses what is called a Multi-Shock strategy. Here, multiple thin, ballistic shield layers separated by some distance act to “shock” the incoming projectile and disperse its energy before it strikes (and potentially breaches) the pressure containment layer. So, again returning to the 2009 Destefanis paper, REMSIM softgoods test articles boasted surviving getting blasted with half-inch aluminum spheres at speeds exceeding 15,000 miles per hour. (This agrees with claims made in the aforementioned 2005 Popular Science article, which reports that Bigelow softgoods withstood a half-inch aluminum sphere impacting at better than 14,000 miles per hour.) Not too shabby at all, and according to the research, meets or exceeds the debris protection performance of rigid ISS modules using traditional “stuffed” Whipple Shields. This implies that BEAM’s protection factor against micrometeorites and debris is just fine, if not outright superior to rigid modules. 5] What sort of radiation protection should we expect from BEAM? This has been a big question, and one NASA has expressed particular interest in. In fact, it’s one of the primary functions of BEAM to determine just how favorable the radiation protection qualities of a softgoods spacecraft are. The problem with space radiation is that it is generally more massive and highly energetic compared to ionizing radiation encountered on Earth’s surface, which makes it difficult to shield. The problem with talking about space radiation shielding is that it depends on a boatload of variables — the more active our Sun, the more it deflects even more damaging radiation from exploding stars in our own Galaxy (and beyond) but trades it for an increased risk of being hit with lower-energy but overwhelming solar storms. Blanket statements about how anything shields radiation in space are therefore difficult to reliably make, requiring multiple models and depending strongly on orbit altitude, timing, and precise material breakdown. As a result, experts tend to either sound uncertain or evasive. Keeping all of this in mind, if we return to the 2009 Destefanis study one final time, we find it has something to say about this as well. By placing test articles meant to represent different types of spacecraft and spacecraft materials in front of particle accelerators powerful enough to fling atoms as large and fast as those fired into the cosmos by exploding stars, researchers can reliably predict how materials will shield against space radiation. This is exactly what the Destefanis study reports, using an iron-atom slinging accelerator at Brookhaven National Lab. The results of the Destefanis work reveal that against the most damaging type of radiation experienced at the ISS (heavy Galactic Cosmic Rays), REMSIM shields nearly half as well (3%) as an empty ISS module (8.2%). It achieves this with less than a third of the equivalent mass, demonstrating a pound-for-pound benefit in REMSIM’s favor, not to mention the unprecedented capability of squeezing into a tiny payload space during launch. In a big-picture sense, the chart also reveals that REMSIM shields only 10% as well against heavy GCR as a fully-outfitted ISS module (3% versus 28.7%). While this might sound terrible at first glance, this is due largely to the fact that Columbus is currently far from empty, ringed with equipment racks, piping, tubing, cabling, and supplies. All of this extra material serves as supplemental shielding for astronauts located within. By contrast, the basic REMSIM in this study is (like BEAM) completely empty, making the “10%” claim a somewhat unfair apples-to-oranges comparison. However, numbers like these more closely match the current situation between BEAM and the rest of ISS. So, ultimately, if the REMSIM-BEAM comparison holds, one might expect a similar ratio between GCR-radiation shielding measurements made in BEAM and parallel readings taken across the rest of the ISS. And while the numbers might sound grim to the uninitiated, numbers like these are going to be exactly what NASA is looking for. I hope the information compiled in this post has been helpful at least to some, and as always, feedback is welcome.